Opals, with their arresting play of colour and light in a myriad of variations, have long been regarded as a gemstone of intrigue. The Romans considered this gem precious and powerful and called it Opalus, meaning ‘precious stone’. 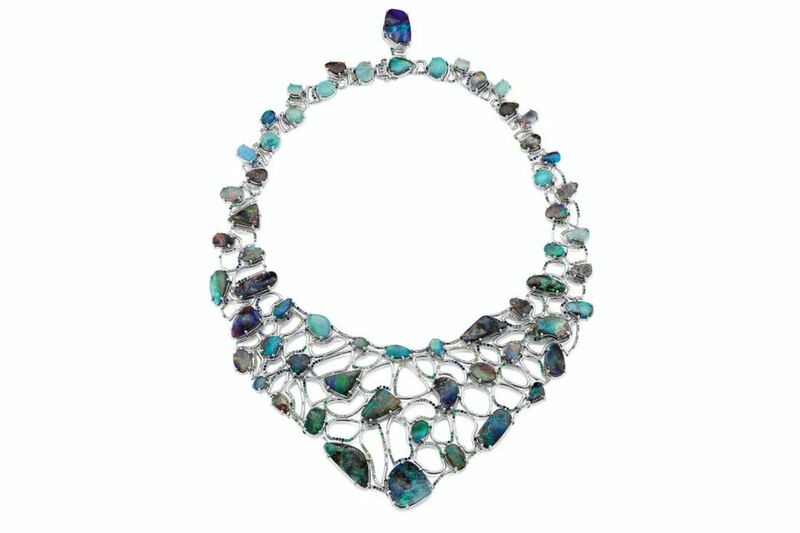 The Bedouins imagined it to have fallen from the sky during thunderstorms; while the ancient Greeks believed opals imbued their wearers with the gift of prophecy and guarded them from disease. 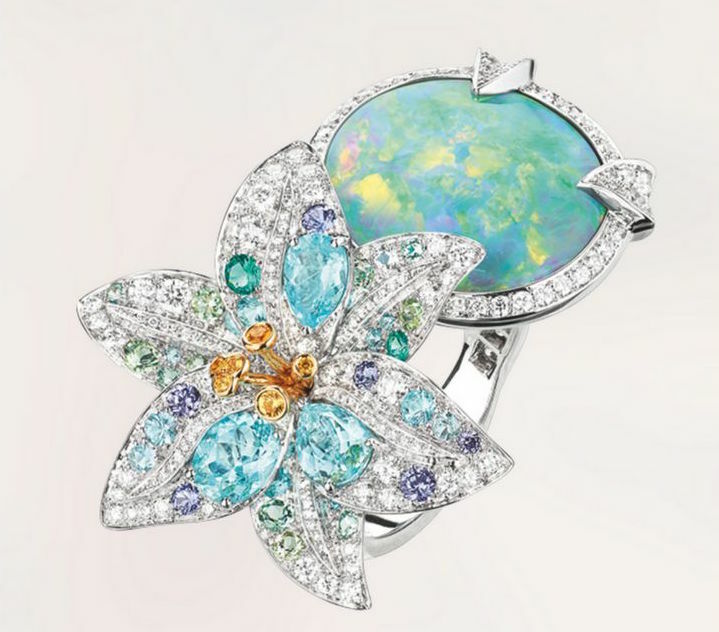 So how are opals formed, and what creates the gorgeous speckles within the stone? According to GIA, opals contain water trapped in its silica structure and are formed ‘when water evaporates and leaves behind solid deposits of silica in the cracks and between the layers of underground sedimentary rock’. Precious opals display a brilliant play of colours, which quite interestingly is often absent in common opals. The flashing rainbow colours are formed by sub-microscopic spheres stacked in a grid-like pattern. 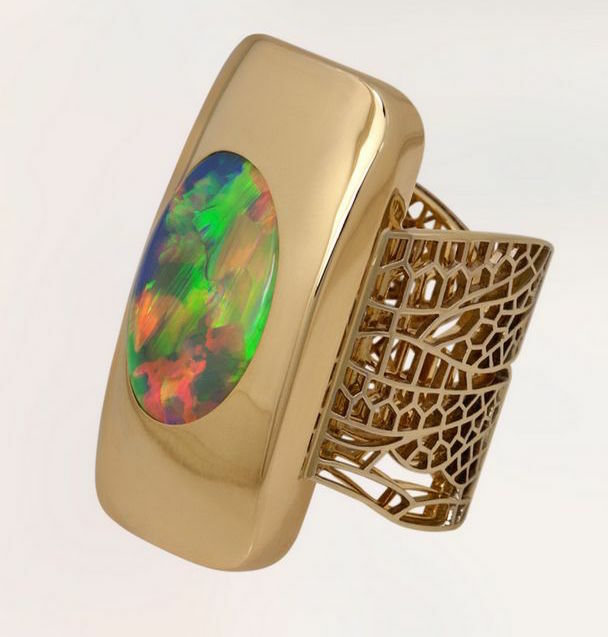 Not surprisingly, opals have captured the imagination of designers then and now. 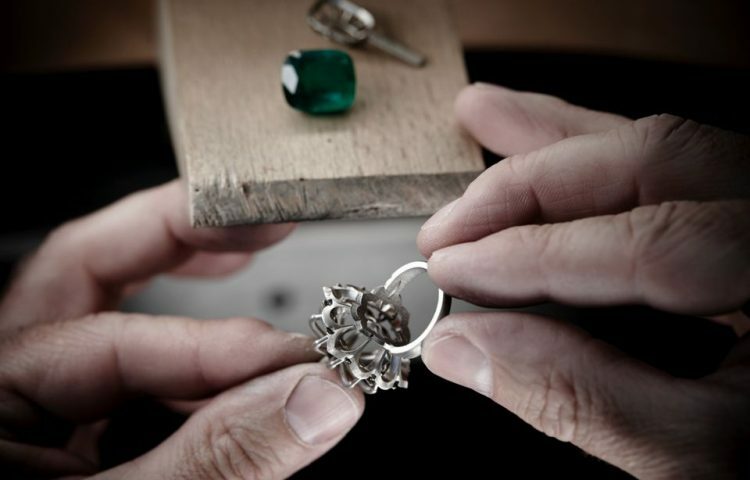 The five main types often used in jewellery design are white or light opal, black opal, fire opal, boulder opal, and crystal or water opal. 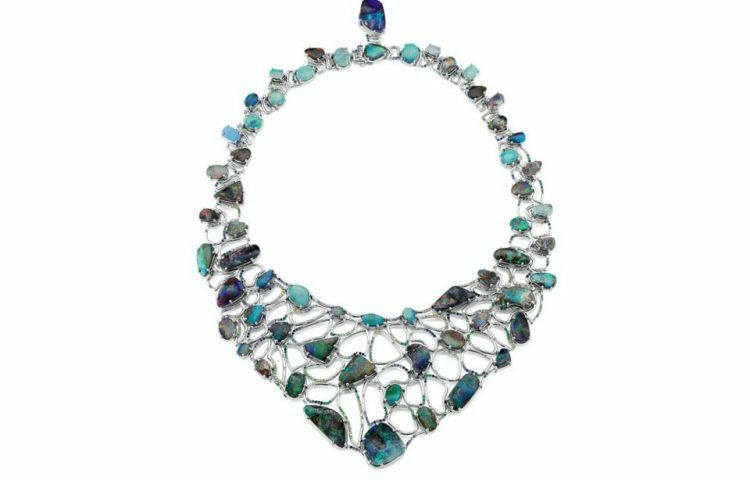 Black opals and boulder opals star in a one-of-a-kind platinum necklace designed by Roland Krainz of Fine Jewels of NYC. 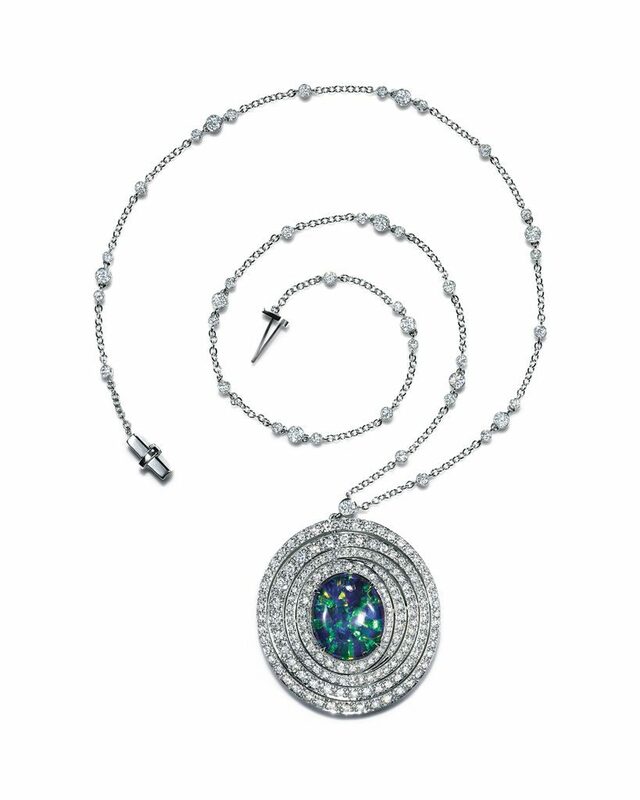 Inspired by nature, seaside, and rocks, this standout necklace is accented with sapphires, diamonds, tsavorites, and emeralds. 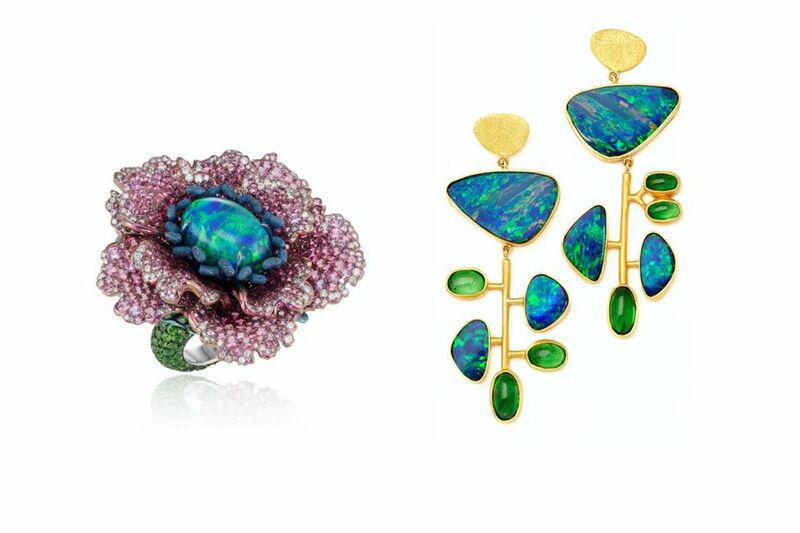 High Jewellery designer Feng J has been using opals both as a signature element and an inspiration since the beginning of her career. 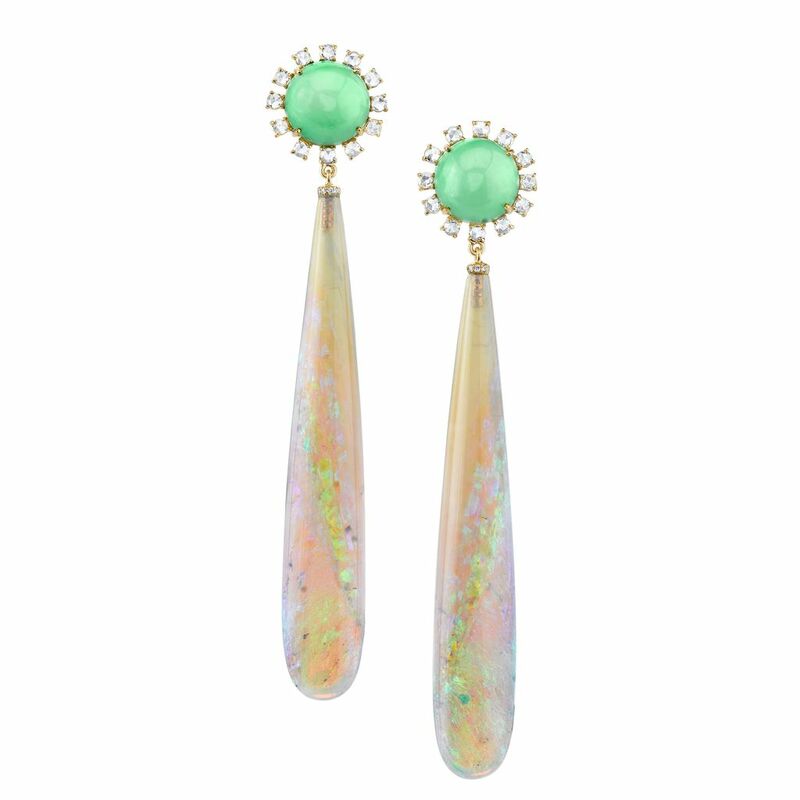 Feng’s Sistine opal earrings feature white opals. 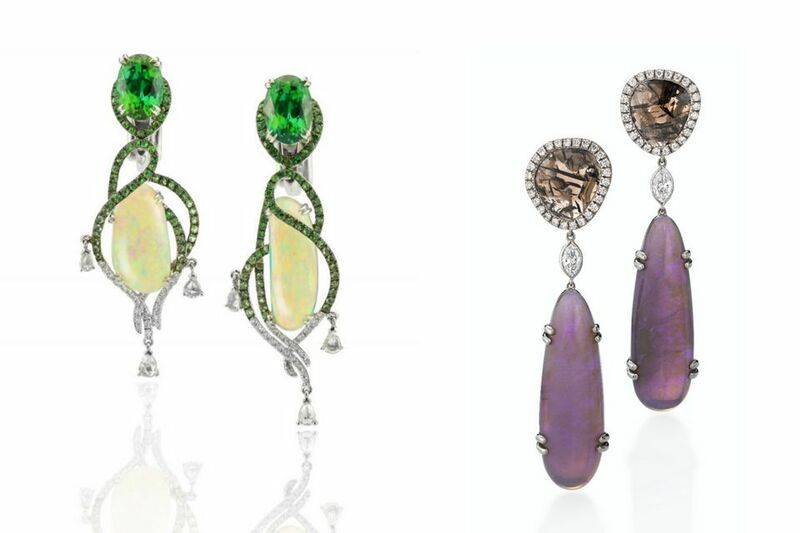 The designer likes to accent opals with moonstones, especially when using crystal opals, and believes diamonds are always a good way to embellish opals creations. 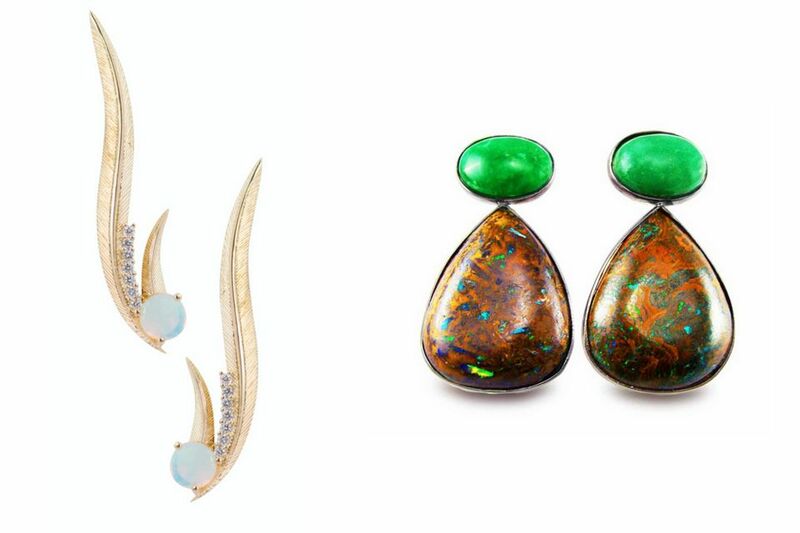 Jen Rush’s Calder-inspired gold drop earrings for her brand, Rush Jewelry Design, feature green-blue opals. 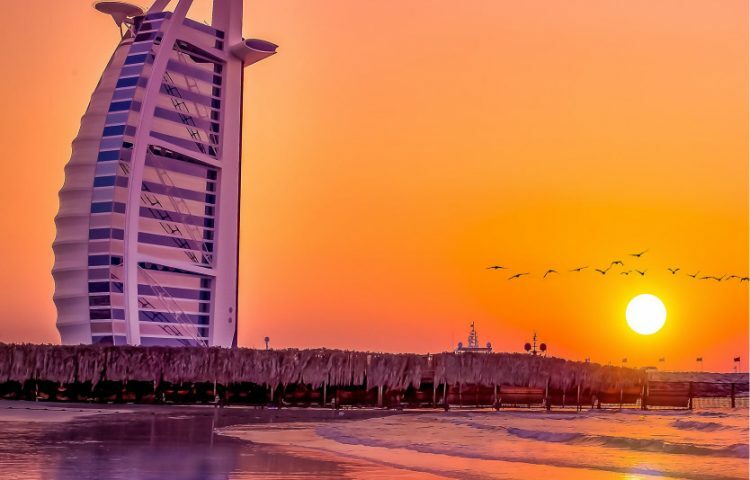 “As an avid art enthusiast and collector, I think it is important to experience different mediums of art,” shares Rush. “One of the most interesting forms of sculpture to me is something that became known as kinetic art, where carefully balanced components or forms move with air.” Her handmade earrings, indeed, resemble mini-Calderesque sculptures. 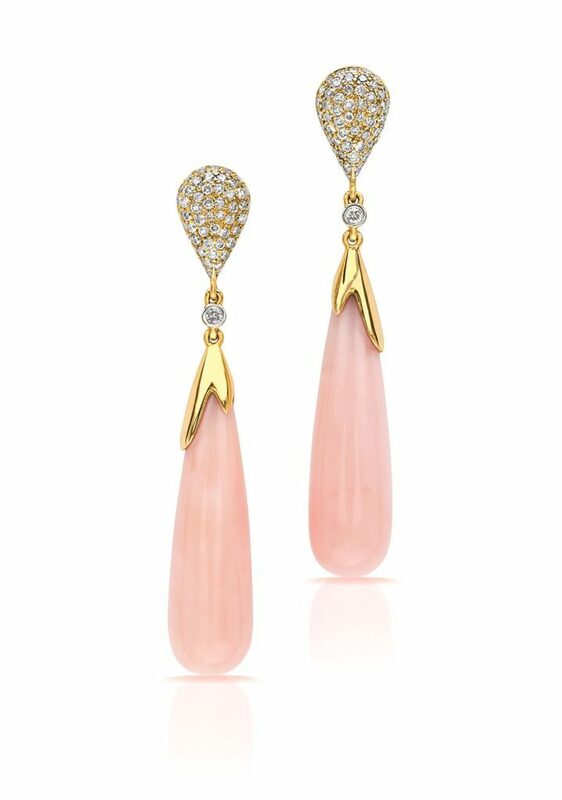 “Though inspired by Calder, in a way these earrings are actually the ‘anti-Calder’,” she adds. 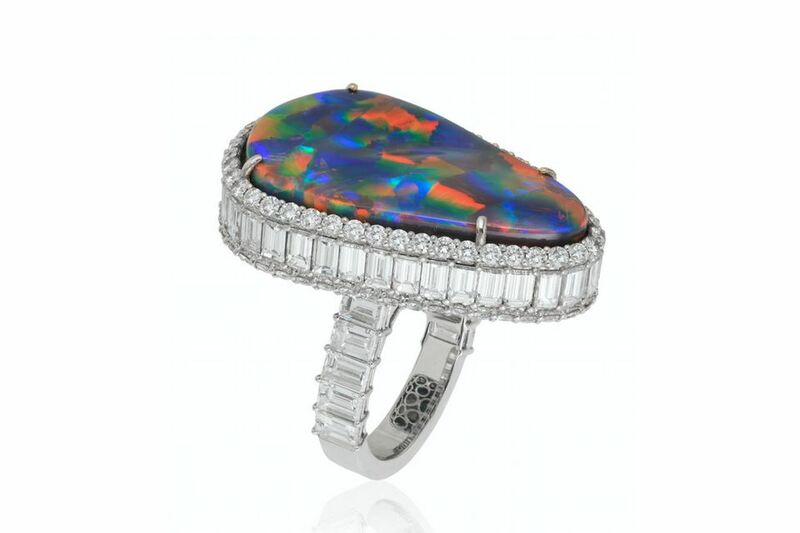 VTse’s Harlequin opal and diamond statement ring is a riot of colours. 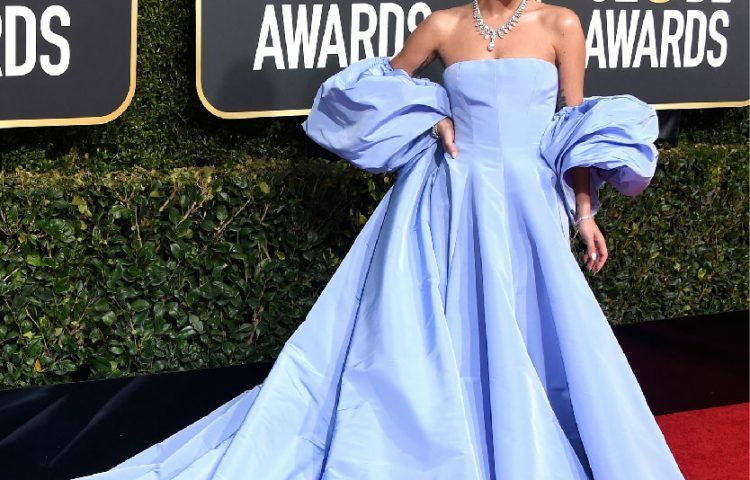 “This stone is sought-after by collectors, miners, and lovers of gemstones because the Harlequin is an extremely rare pattern of repeating contracting diamonds or elongated squares, which encase the whole stone. 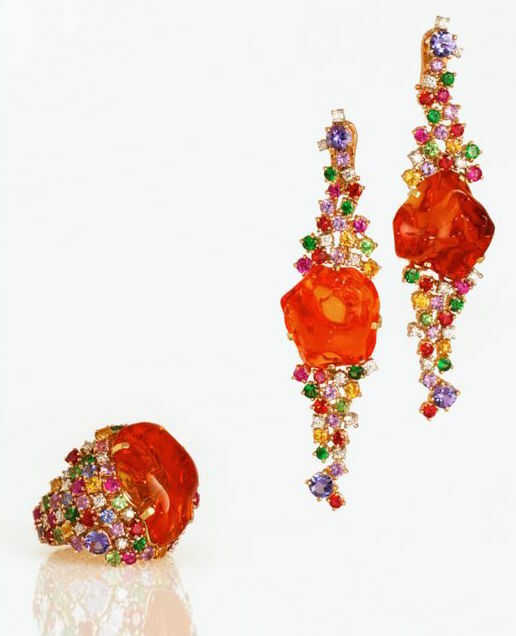 As a gem lover, I fall deeply in love when I come across these rare beauties,” says Victoria Tse, Founder and CEO of the brand. 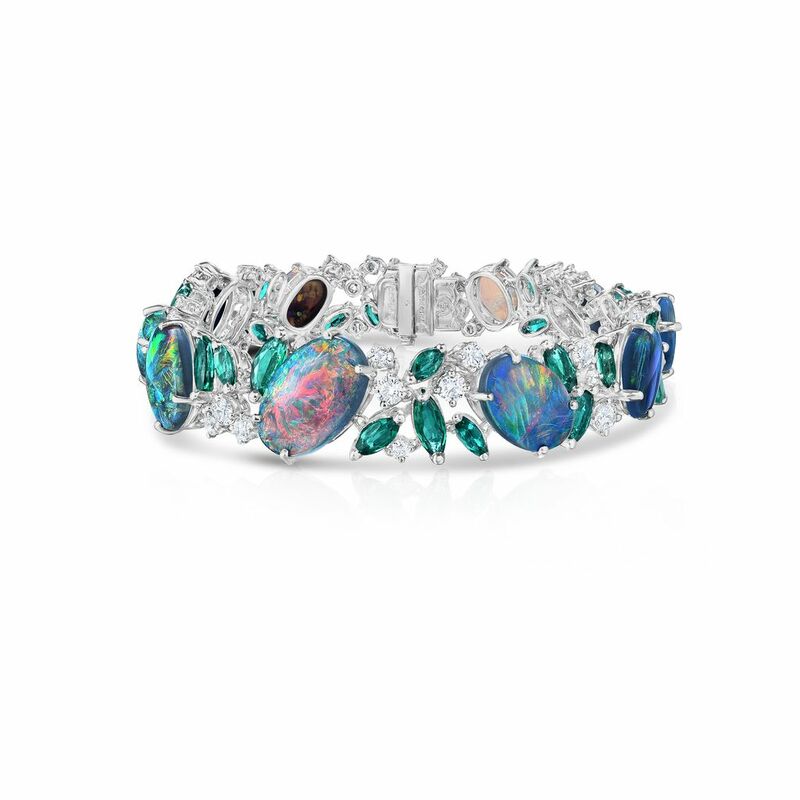 With ideas for new and exceptional designs taking shape, Piaget, Chaumet, Chopard, Dior, Oscar Heyman, Sartoro, and Irene Neuwirth frequently incorporate opals into their serious high jewellery pieces.